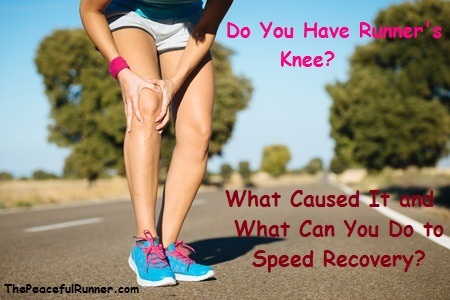 Do You Have Runners Knee? Runners knee is a painful knee injury that runners experience when the cushioning cartilage under the knee cap becomes soft or worn and the knee cap no longer slides easily over the knee. A dull pain is felt behind or around the top of the knee cap. 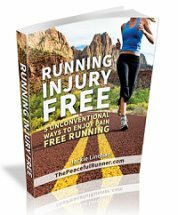 It is the most common of all running injuries and accounts for 16.5 percent of injuries. NOTE: If you are experiencing pain on the outside of your knee, you are probably suffering from IT band syndrome. 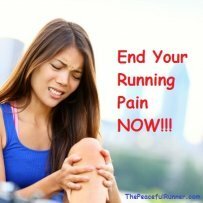 With runner's knee, the knee pain feels worse after running downhill or walking downstairs. You may experience swelling and inflammation and hear clicking or popping sounds when moving the knee as the knee cap is off track. Sitting for long periods of time will aggravate the condition. As with any injury you may experience, always seek advice from a medical professional. There are a number of possible causes for runners knee, but the problem doesn't usually originate in the knee. It can be caused by an incorrect running posture or an imbalance of the muscles that support the knee. If you have weak quadriceps and tight hamstrings, it can create an imbalance that puts too much stress on the knees. The most important part of recovery that no one wants to hear about is rest. It is essential to rest (sometimes for several weeks or more) to provide time for the tendons and ligaments to heal and the inflammation to settle. Without proper recovery, you may develop a chronic knee injury. Try using positive affirmations to help you stay positive and speed recovery. Deep water running is a great way to maintain your fitness while taking a break from running. It is a non-impact workout that most closely emulates running. Seek professional medical advice, which will probably involve physical therapy treatments to help balance the muscles that support the knees. 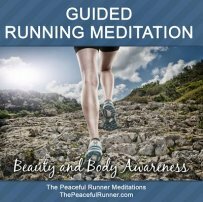 You may also want to try Reiki for Runners as it can help injuries heal faster. Use a knee sleeve to help improve blood circulation to the area and reduce swelling. When you feel that it is ok to try running again, start back slowly and gradually. You don't want to aggravate your knee pain. This is the time to re-evaluate your running posture and particularly your running foot strike especially if you are a heel striker. If your form or your landing strike is the source of the problem, the knee injury will re-occur unless corrected. If you have experienced Runners Knee, please share your experience in the comments below so others can benefit from your experience.